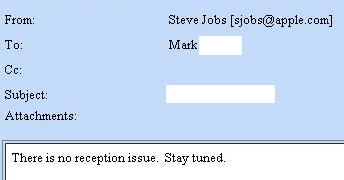 A MacRumors forum user got the following email from SJobs after asking about the wireless issue. rfbandit (Mark) was asking about Apple’s policy on giving free bumper cases to alleviate the issue. “I love everything about the phone except my signal issues”, he wrote. There is no reception issue? I absolutely love my iPhone 4 but we can easily reproduce this reception issue on my phone to the point where data is cut off and calls drop. Am I crazy? How about those 80,000 people on YouTube or the majority in the MacRumors poll? 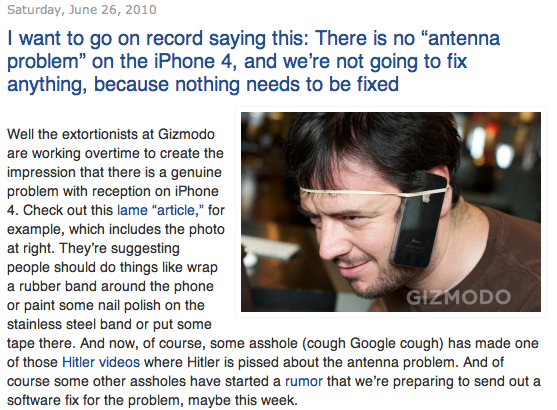 I’m really hoping that Jobs is talking in future-speak and a baseband update comes out next week that makes this all go away.